Cleveland Browns wide receiver Josh Gordon (12) makes a catch during warmups before the game at FirstEnergy Stadium in Cleveland. Reaction to the move came quickly on social media. 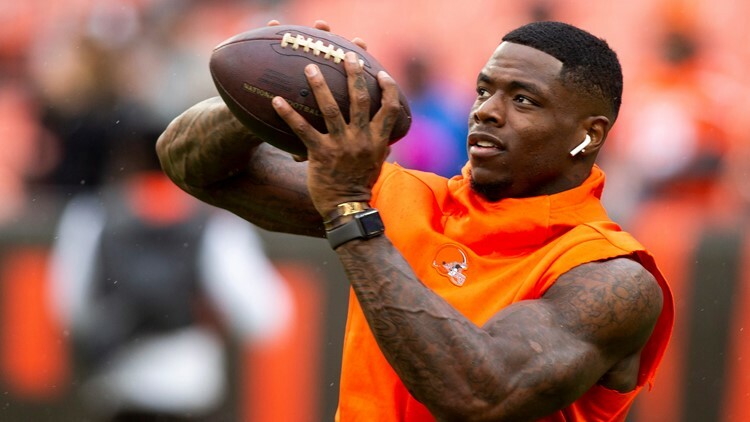 On Saturday, the Browns announced wide receiver Josh Gordon would be released following the team's Week 2 Game Sunday in New Orleans. The former Pro Bowler Gordon—who had already been ruled out with a hamstring injury—has played in just 11 games since 2014 due to various suspensions for substance abuse violations. It is not yet clear what the breaking point was, but general manager John Dorsey says the organization has "reached a point where we feel it’s best to part ways and move forward." Reaction to the move came quickly on social media, with many glad to see Gordon finally gone for good. Good riddance to this joke of a "pro"
So you keep a guy through all his suspensions support his comeback he comes back support his leave of absence in training camp still support him comes back score a huge td in week 1 then cut him??? Wtf??? Even current and former teammates chimed in, with many taken aback by the move. But of course, many just repeated the all-too-familiar phrase: "Same old Browns." We need "Hard Knocks" during the regular season.